Azospirillum sp. is one of the most studied genera of plant growth-promoting rhizobacteria (PGPR). The ability of Azospirillum sp. to promote plant growth has been associated with its ability to produce several phytohormones, such as auxins, gibberellins and cytokinins, but mainly indole-3-acetic acid (IAA). It has been propoosed that the production of IAA explains the positive effects of co-inoculation with Azospirillum sp. 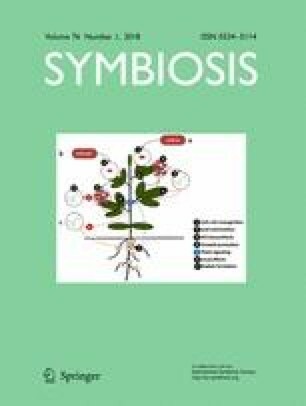 on the rhizobia-legume symbiosis. In this study, we constructed an IAA-deficient mutant of A. brasilense Az39 (ipdC − ) by using a restriction-free cloning method. We inoculated soybean seeds with 1·106 cfu·seed−1 of Bradyrhizobium japonicum E109 and co-inoculating leaves at the V3 stage with 1·108 cfu.plant−1 of A. brasilense Az39 wt or ipdC − or inoculated leaves with 20 μg.plant−1 synthetic IAA. The results confirmed soybean growth promotion as there was increased total plant and root length, aerial and root dry weight, number of nodules on the primary root, and an increase in the symbiosis established with B. japonicum E109. Nodule weight also increased after foliar co-inoculation with the IAA- producer A. brasilense Az39. The exogenous application of IAA decreased aerial and root length, as well as the number of nodules on primary roots in comparison with the Az39 wt strain. These results allow us to propose a biological model of response to foliar co-inoculation of soybean with IAA-producing rhizobacteria. This model clearly shows that both the presence of microorganism as part of the colonization process and the production of IAA in situ are co-responsible, via plant signaling molecules, for the positive effects on plant growth and symbiosis establishment. The online version of this article ( https://doi.org/10.1007/s13199-017-0536-x) contains supplementary material, which is available to authorized users. We thank Universidad Nacional de Río Cuarto, Consejo Nacional de Investigaciones Científicas y Tecnológicas (CONICET), Fondo Nacional de Ciencia y Tecnología (FONCyT) and Instituto Nacional de Tecnología Agropecuaria (INTA, Argentina). Fabricio Cassán is a Researcher of CONICET at the Universidad Nacional de Río Cuarto. Gaston Lopez is a postdoctoral researcher; José Gualpa and Romina Molina are PhD students at the Universidad Nacional de Río Cuarto and granted by CONICET.